The monsoons had turned out to be painful for Bhikhu. At the start of the monsoons, the heist at Baikuntha Saha’s house in Basantapur had gone dreadfully wrong. His whole gang had been captured. Of the eleven members, only Bhikhu managed to escape, but not before being wounded in the shoulder by a spear. He travelled ten miles overnight to the Mathabhanga Bridge. During the day, he hid out in the mangroves, half-submerged in mud. That night he did another twenty miles on foot to Pehlad Bagdi’s home in Chitalpur. Pehlad flatly refused him shelter. Instead, he pointed at the shoulder and said, "Ugly wound, partner. Sure to turn septic. It’ll swell up. Can’t keep all that a secret for long, eh? If only you hadn’t killed…"
"Feel like killing you right now, Pehlad." "Not in this lifetime, partner." There was a forest nearby, about five miles north. That’s where Bhikhu was forced to hole up. Pehlad cut down some bamboo stalks and rigged up a machaan1 for him in the dense sinjuri bushes. He also put together a makeshift canopy of palm leaves and said, "The rains have driven the tigers up into the hills. Should have a nice, relaxed stay here, Bhikhu. If the snakes keep away, that is." "Didn’t I give you some chira2 and jaggery? I’ll bring you some rice in a couple of days; if I come here too often, people could get suspicious." Pehlad bandaged up the wound with leaves and herbs and promised to return as soon as he could. The fever hit Bhikhu that night. The next morning, he realised that Pehlad had been right. The wound had become infected. His right arm was badly swollen and totally immobile. In a forest that even tigers fled during the monsoons, Bhikhu managed to survive two days and two nights on that narrow platform; feverish and in pain, braving the downpour, mosquitoes and bugs, pulling off leeches from some part of his body every hour. He was drenched to the skin when the rain swept in, left wheezing during the stifling, sultry day, driven mad by creepy-crawlies. The bidis that Pehlad had left behind were gone. The chira would last another two or three days, but there was no more jaggery. The red ants that had come for it in hordes were sorely disappointed and took it out on Bhikhu. Damn Pehlad to hell, thought Bhikhu as he battled for life. On the morning that Pehlad was supposed to return, Bhikhu ran out of drinking water. He waited till evening for Pehlad. Unable to bear the terrible thirst any more, he climbed down to the nearby creek, filled half the pot and climbed back onto the platform, in indescribable pain. Hunger drove him to chew on the dry chira. With his one good hand, he kept squashing the ants and other insects. He applied some leeches around his wound, hoping they would draw out the infected blood. He saw a green snake peering through the sinjuri leaves above his head and waited a full two hours, staring at that point with his lathi3 in hand. He beat the undergrowth with the stick every hour to drive snakes away. He wasn’t going to die. He was definitely not going to die. Wild animals would have found it impossible to survive in those conditions, but he would cheat death. Pehlad had gone to another village for a wedding in the family, had passed out on the toddy they served there and didn’t return even the next day. In fact, for three days, he was in no shape to reflect on how Bhikhu was surviving in the forest. Meanwhile, Bhikhu’s festering wound was oozing bloody pus. His body was bloated. The fever had subsided, but the excruciating pain in his body enveloped his senses like an intoxicant. He was no longer affected by hunger or thirst. He was unaware of the leeches gorging on his blood until they dropped off. His foot knocked the water pot off the platform and it broke. His chira, sodden with rainwater, rotted in its sack. Jackals, attracted by the foul smell of his gangrenous wound, circled the machaan in the dark. Pehlad returned from his relatives’ in the afternoon, went to see Bhikhu and gravely shook his head. He had brought a bowl of rice, fried fish and vegetables for Bhikhu. He sat with the sick man until late in the evening, and then finished the food himself. He went back home and returned with a small ladder and his brother-in-law Bharat. Using the ladder as a stretcher, the two of them carried Bhikhu back to Pehlad’s house. They put him on a pallet of straw up in the loft. And Bhikhu’s life force was so strong that in spite of this modest shelter and the total lack of medical care, he triumphed over death. But he lost the use of his right arm. He could barely move it at first and soon it shrivelled up like a dead branch, completely useless. With his wound almost healed, Bhikhu sometimes climbed down from the loft, using only one hand, when he was sure there was no one around. Then, one evening, he did something extreme. Pehlad wasn’t home. He had gone off with Bharat to drink toddy. Pehlad’s sister had gone down to the river. His wife went into the room to put her child to bed. She saw the look in Bhikhu’s eye and tried to get out as quickly as possible. Bhikhu grabbed her arm. But Pehlad’s wife was a daughter of the Bagdi. It wasn’t easy to pin her down with only one good arm and a feeble body. She jerked her arm away and left the room, screaming insults. When Pehlad returned home, she told him everything. His brain clouded by toddy fumes, Pehlad’s immediate reaction was to blow away the double-crossing devil. Whacking his wife with his stout bamboo stick, he stormed off to split open Bhikhu’s head. But even in his inebriated state, he realised soon enough that although it was his momentous responsibility to do so, it might not be entirely possible. Bhikhu was standing ready with a razor-sharp chopper gripped firmly in his left hand. So instead of lethal blows, they exchanged some well-chosen invective. At the end of which Pehlad said, "I had to spend seven rupees on you — give my money back and get the hell out of my house — scram!" "I had a little armlet — a baju — tucked in my waistband," replied Bhikhu. "You stole it. I want it back. Then I’ll go." "Who cares what happened to your baju?" "You’d better return my armlet, Pehlad! Or I promise I’ll slash your throat wide open like I did with the second of the Saha brothers. I’ll leave when I get my armlet." Of course, Bhikhu never did get his armlet back. In the middle of the commotion, Bharat landed up and the two overpowered Bhikhu. All that a weak and crippled Bhikhu could manage was a bite on Pehlad’s arm. Pehlad and his brother-in-law thrashed Bhikhu to within an inch of his life. His wound opened up again. He wiped off the blood with his palms and staggered off. Although no one could figure out where exactly he disappeared to under cover of the darkness, the neighbourhood woke up in alarm at midnight to find Pehlad’s house on fire. "Disaster… total disaster! The evil Shani4 had come to my house," cried Pehlad, slapping his forehead. But to avoid the attentions of the police, he couldn’t reveal Bhikhu’s name. That night, Bhikhu’s primal, barbaric existence moved into its second phase. There is a river beside Chitalpur. After setting Pehlad’s house on fire, Bhikhu had stolen a fishing boat and floated down the river. Too weak to row, he had just about managed to steer, using a piece of flattened bamboo for a rudder. By morning, he hadn’t been able to get very far. Bhikhu was afraid that having lost his home, a vengeful Pehlad would disclose all to the police without a thought for the consequences. The police had been after him for quite some time now and after the murder at Baikuntha Saha’s place, they had doubled their efforts. To show up anywhere within thirty miles was a huge risk. But Bhikhu was desperate. He hadn’t eaten anything since the previous evening. He was weak and his aching body was still stiff from the beating. He docked his boat at a sub-divisional town at dawn. He washed away the blood in the river and then went into town. Hunger was driving him crazy. He couldn’t even buy some muri5 — he had no money. He stopped the first person he saw on the road to the market. "A couple of paisas, sir?" he begged. 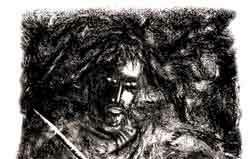 The gentleman saw his dusty unkempt hair, tattered and muddy loincloth, and a withered arm dangling like a rope. He felt sorry for Bhikhu and gave him a coin. "Only one, sir? How about another?" ventured Bhikhu. "Not happy with one, eh," snapped the irritated gentleman. "Get lost." For a fleeting moment, Bhikhu was on the verge of hurling his choicest expletive at the man. But he checked himself. Instead, he gave the gentleman a menacing look, bought himself some muri from the grocer and gobbled it down. And so it was that Bhikhu became a beggar.